Crispy bacon, soft scrambled egg, velvety avocado and Sriracha nestle on a warmed tortilla in this breakfast tacos recipe that is perfect any time of day! I love any excuse to combine bacon and eggs, don’t you? And while the old classic of over easy with a side of perfectly cooked bacon is always A-OK with me, I do like to shake things up a little from time to time, bacon and egg-wise. This easy and festive version of breakfast tacos is the perfect thing to make when your house slowly stretches out of bed on New Year’s Day, not only because it is full of good things like mashed avocado and warm tortilla and yep, bacon and eggs…but because that little red drizzle over the top is some open-your-eyes-wide Sriracha sauce. Depending on how much champagne was had the night before, you may want to adjust the amount! Start by cooking yourself up some bacon – I like to cut the slices in half first so that they fit into the tortilla just perfectly. Keep them warm and scramble up the eggs in the same pan so that they take on just a little hit of bacon flavor. YUM. As for the tortillas, you want them just a little bit warm. You can wrap them in paper towels and put them in the microwave for about 30 seconds, but I love making mine just a little charred…I put them right on the grate of my gas stove, turn the heat on low, and flip them a couple times with long pair of tongs. It takes less than a minute for both sides of the tortilla to have a beautiful little char. Now the assembly! Spread each tortilla with some mashed avocado, a generous spoonful of scrambled eggs, a few half slices of bacon and if you are up for it, a drizzle of Sriracha sauce or a few shakes of Tabasco. Scatter some parsley on top, fold the while thing up into a roll, pick it up and take a bite. I think it’s going to be a very delicious year! 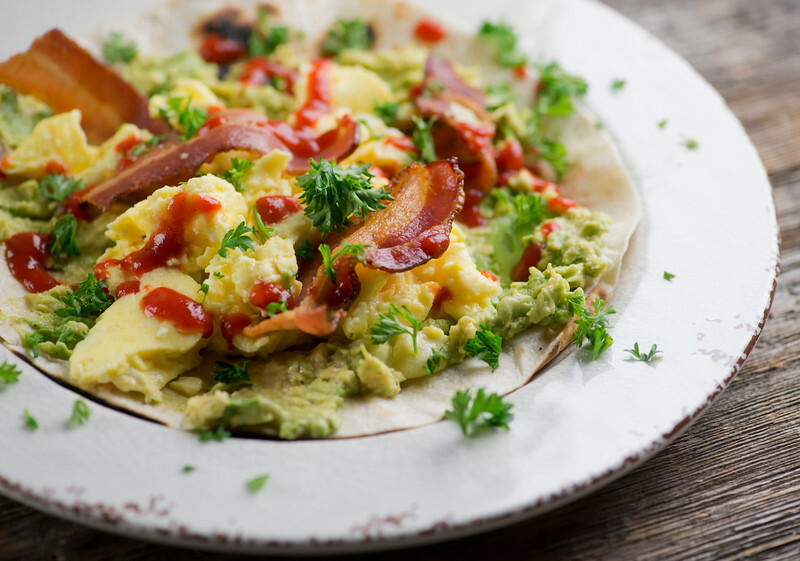 Crispy bacon, soft scrambled egg, velvety mashed avocado and a little Sriracha nestle on a warmed tortilla in this breakfast taco recipe that is perfect any time of day! Heat a large skillet over medium high heat and cook bacon until it is done the way you like it. Remove bacon to a paper-towel-lined plate, cover with foil to keep warm and set aside. Whisk eggs until well combined and add to the skillet with the bacon drippings. Stir until they are softly scrambled. Remove from skillet to a bowl and set aside. Heat the tortillas, either for 30 seconds in the microwave or if you like a little char, place them on the grates on your gas stove over low heat for a minute, turning carefully a few times with tongs. Spread the warmed tortillas with mashed avocado. Top with egg, bacon, a drizzle of Sriracha or Tabasco sauce if you are feeling adventurous, and a scattering of parsley. Serve at once, telling folks to roll up the tortillas and dig in! What?? No cheese, I used some left over Port Wine cheese ball rolled in almonds in my breakfast taco and it was delish. Can’t seem to get my family to do eggs with avacado but chopped tomatoes add a little healthy veggie to the mix. Happy New Year to you and yours.